Guterres said he would be ready to support any efforts towards bringing about denuclearization in the Korean Peninsula in a peaceful manner. 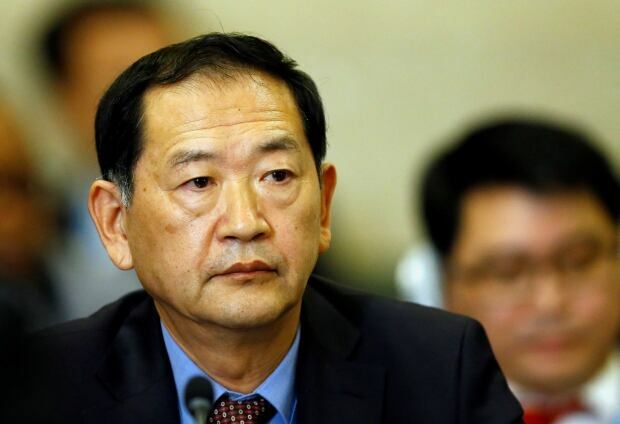 Han Tae Song, ambassador to the United Nations in Geneva, confirmed that North Korea, officially known as the Democratic People’s Republic of Korea (DPRK), had successfully conducted its sixth and largest nuclear bomb test on Sunday. “The recent self-defence measures by my country, DPRK, are a gift package addressed to none other than the U.S.,” Han told a disarmament conference. “The U.S. will receive more ‘gift packages’ from my country as long as its relies on reckless provocations and futile attempts to put pressure on the DPRK,” he added without elaborating. U.S. Ambassador Nikki Haley told an emergency Security Council meeting called in response to North Korea’s Sunday nuclear test that the U.S. wants a new UN resolution with tougher sanctions adopted by Sept. 11. Russia is also skeptical of the efficacy of more sanctions. 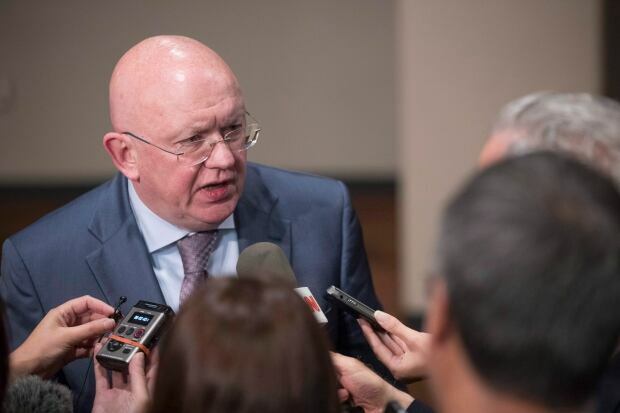 Nebenzia said that despite good intentions, sanctions against North Korea aren’t working and Moscow wants a new UN resolution to focus more on a political solution of the crisis over North Korea’s nuclear and missile programs. He told reporters at UN headquarters on Tuesday that the only initiative currently on paper is a Chinese-Russian proposal that would halt North Korea’s nuclear and missile tests in exchange for the U.S. and South Korea halting their joint military exercises. He said possible new economic sanctions would affect ordinary Koreans, not the nuclear or missile programs. Haley acknowledged on Tuesday that more sanctions on North Korea are unlikely to change its behavior but would cut off funding for its ballistic missile and nuclear programs. White House Press Secretary Sarah Huckabee Sanders said Tuesday “all options are on the table” to deal with North Korea, including diplomatic and economic measures, but said that talks with Pyongyang were not the current focus for the White House. She also said U.S. President Donald Trump continues to see the denuclearization of the Korean Peninsula as the priority. “We’re going to continue to push for a safer and denuclearized Korean Peninsula, and that’s the priority here,” she said. Wall Street stocks fell on Tuesday as U.S. trading reopened for the first time since the North Korean nuclear bomb test, and the U.S. dollar and Treasury yields fell. Diplomats have said the Security Council could consider banning North Korean textile exports, banishing its national airline and stopping supplies of oil to the government and military. Other measures could include preventing North Koreans from working abroad and adding top officials to a blacklist aiming at imposing asset freezes and travel bans. China accounted for 92 per cent of North Korea’s trade in 2016, according to South Korea’s government. Meanwhile, South Korea said on Tuesday an agreement with its ally the United States to scrap a weight limit on its warheads would help it respond to North Korea’s nuclear and missile threat. 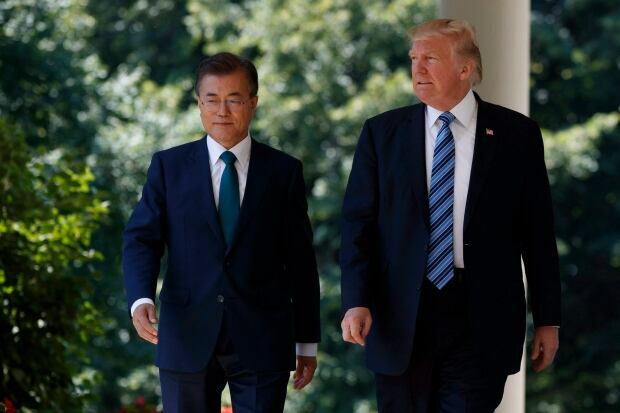 Trump and his South Korean counterpart, Moon Jae-in, agreed on Monday to scrap a warhead weight limit on South Korea’s missiles, South Korea’s presidential office said, enabling it to strike North Korea with greater force in the event of war. Trump said he has given the go-ahead for Japan and South Korea to buy a “substantially increased amount” of sophisticated military equipment from the United States. South Korea and the United States are technically still at war with North Korea after the 1950-53 Korean conflict ended with a truce, not a peace treaty. Both sides have thousands of rockets and artillery pieces aimed at each other across the world’s most heavily armed border. South Korea’s Asia Business Daily, citing an unidentified source, reported that North Korea had been observed moving a rocket that appeared to be an intercontinental ballistic missile (ICBM) towards its west coast. The rocket started moving on Monday and was spotted moving only at night to avoid surveillance, the newspaper said. South Korea’s defence ministry, which warned that North Korea was ready to launch an ICBM at any time, said it was not able to confirm the report. Analysts and South Korean policymakers believe North Korea may test another weapon on or around Sept. 9, when it celebrates its founding day.